With targeted investments and forward-looking policies, Wisconsin could capitalize on its strengths in sensors and controls for the advanced energy industry to drive economic growth and support over 44,000 jobs annually. That’s according to The Wisconsin Jobs Project: A Guide to Creating Jobs in Sensors & Controls for Advanced Energy, a new report created by the American Jobs Project in partnership with the Wisconsin Energy Institute at the University of Wisconsin–Madison and the Midwest Energy Research Consortium. During the recession, Wisconsin suffered a blow to its legacy manufacturing industry, and the state has yet to recover many of those jobs. In addition, Wisconsin faces a growing need for skilled talent due to an aging workforce, out-migration, and a significant number of underemployed and long-term unemployed residents. “Taking practical steps to grow Wisconsin’s advanced energy sensors and controls sector while strengthening recruitment and retention efforts would put a lot of people to work, while growing the economy in communities across the state,” says Mary Collins, Director of the American Jobs Project and co-author of the report. The sensors and controls industry is projected to grow almost 7 percent annually through 2022. 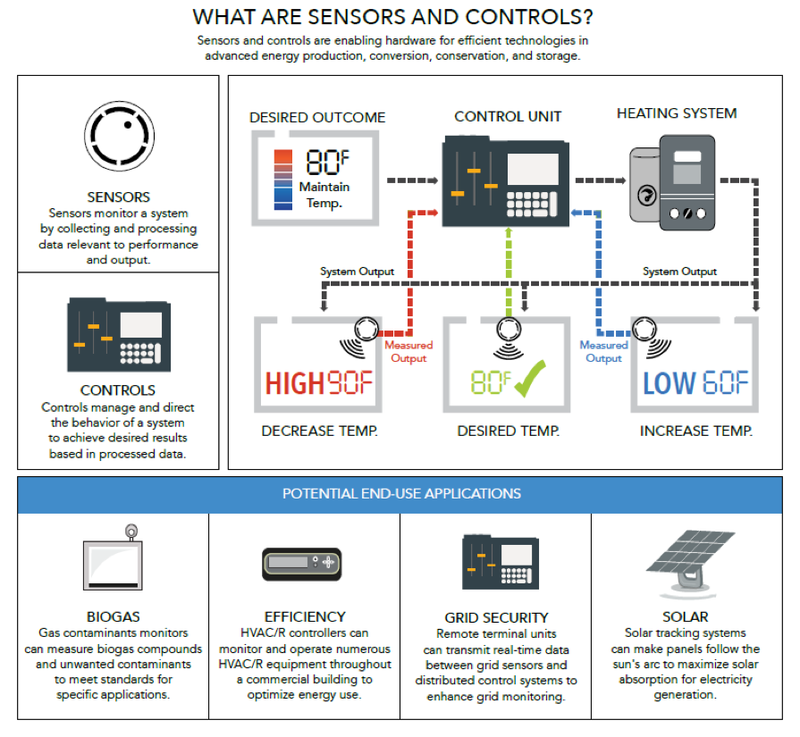 Sensors and controls are hardware solutions that enable advanced energy technologies to be nimble and responsive to changing system-level conditions, such as weather patterns, available input resources, and energy demand. Advanced energy systems require extensive monitoring and operational controls to optimize production, minimize energy use and leverage storage. Wisconsin is well-positioned to tap into this market growth given the state’s base of at least 209 sensors and controls manufacturers, its skilled workforce and focus on technical training, and its engaged university research community. These state assets are fortified by anchor companies such as Johnson Controls and Rockwell Automation, and by clustering efforts in the energy, power, and control (EPC) sector and the energy-water nexus by the Midwest Energy Research Consortium and The Water Council. Wisconsin also has the potential to build a strong local market for Wisconsin-made, sensor- and control-embedded technologies in the biogas, efficiency, grid and solar industries. In-state deployment of sensors and controls for safer and more efficient technologies could not only bolster Wisconsin’s energy economy, but also help to divert back into Wisconsin communities some of the estimated $14 billion currently spent on energy imports. Wisconsin’s sensors and controls industry could support an average of 44,000 jobs each year through 2030. This figure includes direct jobs from manufacturing and software development, indirect jobs from suppliers and induced jobs from spending in the local economy. Providing tax credits for student loan payments to retain college graduates and recruit out-of-state talent. Increasing corporate engagement in the startup ecosystem through corporate venture capital. Facilitating mentorships for entrepreneurs statewide to foster the entrepreneurial culture. Developing testbeds for large-scale energy systems to accelerate technology development. Establishing an innovation voucher program to support university-based consulting on local biogas projects. Expanding the Focus on Energy program to include energy-water nexus projects. The full report is available on the American Jobs Project website at http://americanjobsproject.us/ajp-state/wisconsin.